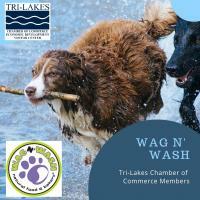 Wag N’ Wash® Natural Food & Bakery is the premier destination for all of your healthy cat and dog needs. A little about us: Our stores are proud to be LOCALLY OWNED and operated by pet enthusiasts from your very own COMMUNITY! Within your neighborhood store, you will find a large variety of SUPPLEMENTS, ALL-NATURAL PET FOODS, COLLARS, TOYS, SUPPLIES, AND UNIQUE GOODS you won’t find in other stores. Our DO-IT-YOURSELF DOG WASH facility is like no other you’ve experienced. Professionally designed to put convenience and fun into the “chore” of washing your dog, Wag N’ Wash® will give you an experience fit for a canine king or queen. Just bring in your dirty dog and we will provide you with everything you need to brush, wash and dry them. We even clean up after you! We also offer professional, full-service GROOMING by appointment. Give your LOCAL STORE a call and we will be happy to discuss GROOMING options with you. 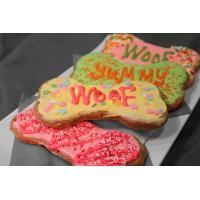 And of course, no trip to Wag N’ Wash® would be complete without visiting our wonderful GOURMET PET DELI AND BAKERY. At the deli your companion pet can choose from such gourmet delights as liver brownies, beef loaf, and poochie sushi, just to name a few. Each store also bakes a large selection of our very own fresh, naturally good biscuits that are sure to please even the pickiest pooch! So come on! Bring your furry friend into your local Wag N’ Wash® Natural Food & Bakery today and see why so many pet guardians have chosen us as the store to wash ’em, feed ’em and Spoil ’em all in one cool place!